Please click on the link below to find out the results from previous events. After the unfortunate cancellation of the 25th Birthday Celebrations, we ran a punch hunt for those that were able to attend. Not as many folk as we’d have liked, however the 7 that did take part had plenty of fun and were kept busy all day looking for the well hidden punches! A great day weather wise, with only a couple of light showers in the afternoon. Ground conditions were a little rough as there hadn’t been any rain for the past week, but that didn’t stop Graham from finding a muddy hole – once when setting up and another when collecting the punches back in! Meanwhile Bob was driving round us in circles, designing the new comp safari route for this year, managing to get 6+ miles of stage. Dave kept his wheels firmly on the flat land, as not having his P38, the borrowed Jaguar F-Pace was not going to be getting any mud on it! Beaten by the wind at 5pm, we then retreated to land near Heriot and enjoyed a good chinwag round the BBQ late into the night, it may even have been morning., with 5 of us camping out overnight! Glendearg Punch Results are available, but do not count towards this year’s Championship. Points have been deducted for those that were incorrect or punched the wrong way around. The first punch hunt of the year, which everyone had been looking forward too after a wee break – very much obvious with the 22 varied vehicles turning up and several new members. A fantastic day with brilliant ground conditions, wet enough to play and get stuck, but not wet enough to be bogged down completely (unless you were one of the unlucky ones. With everyone keen to get out and play, it would appear that some forgot the aim of the game was to find the punches. A sheer 1 minute after everyone set off, there were people finding holes big enough for vehicles to hide in, with Zak and Phil in the running for the “tow out” award at next year’s prize-giving. Results are now final, and available to view in the Championship Dropbox. After forecasts promised us plenty of sleet and snow across the Borders this weekend, what lay ahead for the gaggle of competitors who turned out for this year’s event was much worse… there was no snow, no sleet – just a damp, cold (very cold) wind. With that in mind, the briefing was simple, read the instructions, follow the tulip diagrams and answer the questions along the way – some of which might have to be found by getting out of the car. Unfortunately, the first to feel sheepish was Dave Ellis, who upon arriving at the car park, started to dismantle pieces of his vehicle using the height barrier and when he was set off, turned up a minute later from the same direction claiming to have gone in a circle! As the route progressed, there was hints that the further up the hills we went, there might be a chance of snow, however it was not to be, and upon Soutra, the most we ever came across was some slush… most of it was brown slush due to the high volume of farm traffic. Traveling through places such as Stow, Lauder, Boon, Gordon & Smailholm, the questions ranged from the most obvious such as ‘what colour is the bull that is stationary’ to the more devious such as ‘how many gates to be kept closed’ – there were 10 gates, but only 3 of them specifically said ‘keep gate closed’. At the 3/4 marker, we were treated to a real treat (or would have been if there hadn’t been so much cloud cover), of Scott’s View, overlooking Horseshoe Bend on the Tweed, before heading back down the hill towards Gattonside, Galashiels, Fountainhall and finishing at Heriot where a log fire awaited with a choice of soups, tea and coffee. The forecasters did get it right in the end, but only after everyone had headed home, as we stayed behind to tidy up, the snow was starting to fall rather heavily… here’s to Borders Blizzard ’18, hopefully with more snow. 9th – Dave Ellis (-14pts) (it all went wrong from the beginning)!!! A huge well done to all the crews marshals and organisers. Graham Somerville & Colin Hay marginally beat the other crews to take 1st SORC crew, as well as placing 19th Overall & 3rd in Challenge Class. Stuart Robertson & Russell Turner came away with 3rd Overall crew for the event! Clark Gourlay & Declan Milne will hopefully remember to hand in all the time cards and Highway Code quiz next year! Have you enjoyed keeping up to date? Fancy a shot at it yourself? It’ll be back next year!!! Well our final round of the Trials Championship on Saturday started off fairly damp, with the ground being fairly saturated, which meant we had to think about where we could put some of the sections. It was decided not to go right to the top of the hill, however we did manage to get 10 sections in with what space we had, which didn’t include the valley! An interesting day, with those on road tyres generally performing slightly better than those with mud tyres – very embarrassing for some! It was a great day for the father and son teams, with Neil and Robert Spicer taking a 1-3 win with 0 and 3 points respectively in there Toyota LWB Landcruiser, whilst James and Alastair Dickson in a Suzuki Samurai took a joint second with 1 point each.. and it’s got to be said, they both scored that point on the final section of the day! Meanwhile, further down the table, after getting hid diff-lock to work, Rory Cox almost showed Colin Hay, that a 300tdi Discovery is just as good as the TD5. Talking of a joint win, it would appear that Neil has also taken a 1st Overall in the Championship, with Robert taking 1st for the Juniors. They both only joined at Cold Turkey last year, but have taken to the Trials like ducks to water, so there’s an incentive to come along and join in the fun – now all we need is more WAGs. 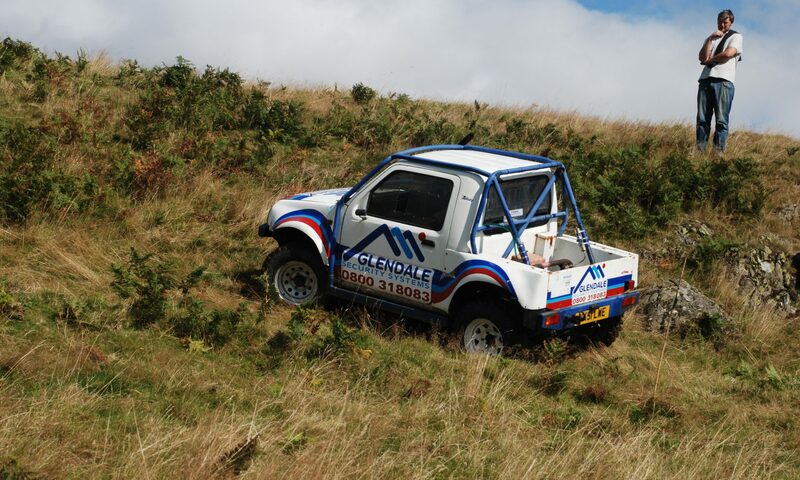 A team of 8 of us headed down to Glendearg to prepare some of the course for the Comp which takes place in two weeks time. We’ve knocked a few walls down, prepared gateways, and lopped a few branches, with a few electric shocks along the way. There’s still a few more fences to snip, and branches to lop, which will be happening on Thursday 15th if anyone’s available, when we will also be setting up part of the course, so we don’t have to do all 7 miles on the Friday. A small team of us have been working yesterday and today setting up for the comp safari this weekend. Unfortunately we will be back up at the crack of dawn to redo all the stakes and arrows since the cattle destroyed most of them. A 7 mile route over and through different obstacles, including a run through the valley where we’re hoping to see some airtime…. Sunday’s Trials at Dunbar started off with a very chilly morning, and slippery sections, making them tricky for some… even the Jimny’s were struggling not to hit the canes! As predicted the weather was fair to middling, with a couple of light sprinklings of rain. However, the sun came out in all its glory, just in time for us to enjoy a lunch break. Whether it was the cold air that made us get through them so quickly or not is unknown, but what must be a first saw us reading out the results for all ten sections before 4pm. After ten years away, James Dickson made a return, proving he’s still got the skills with 3pts (even if it was in a SJ). Meanwhile Robert Spicer learn a hard lesson by not necessarily always listening to your navigator, but still leads the Junior’s. Well it was an eventful Punch Hunt on Sunday, over at Drumclog. The ground conditions were pretty much perfect, with plenty of mud to keep everyone happy, but not too wet – meaning that those on road based tyres managed better than expected! Well done to Chris Kerr for finding the most punches scoring a total of 30 points. Iain Grandison leads overall, with Alan Robertson still a bit behind. Also those who were new or relatively inexperienced, pat yourselves on the back for managing as well as you did in shiny vehicles, on road tyres, showing some of the more experienced folk up! It’s fair to say that not all the punches were found, and not everyone found the same ones.. which means David, Graham and Jim did a good job of hiding them. To whoever moved the one that Dave had used to demonstrate with, we spent forever trying to find it again. Please don’t move them from where they’ve been placed. Well the weather held up yesterday and saw us out in t-shirts, with Dave even breaking out into shorts to show us some leg! A hungry bunch of us headed down to the campsite, had some delicious BBQ food whilst enjoying the music coming from the opposite side of the field, it was almost like being at Glastonbury ourselves (in a more civilised manner). At 2am the music finally finished with one of the all time greats – Caledonia! With a mixture of weather from dreadful downpours to the sweltering heat today, the good food and banter at the BBQ, the live music still playing at 3am, two long days off roading, anyone who’s not tired wasn’t trying hard enough! 2nd place for both is Alan Robertson, but Thomas Quarrell is hot on his heels. 3rd for Trials is Colin Hay. Graham Somerville drops down to 5th after claiming last year’s championship after an unfortunate series of events left him on road tyres. Robert Spicer leads the Junior Championship by a mile and if he wasn’t still a junior would be hot on the heels for 3rd place overall. Christine Judd hasn’t been seen out this year, and neither has Belinda Braithwaite which makes us wonder, will there be a female championship this year?! Sandy Bruce hasn’t been seen in a while either to put us all in our place for the Punch Hunt leaving the way open for Iain Grandison to take the lead!